Goverlan Reach VS LogMeIn Central – how does the new pricing really stack up? 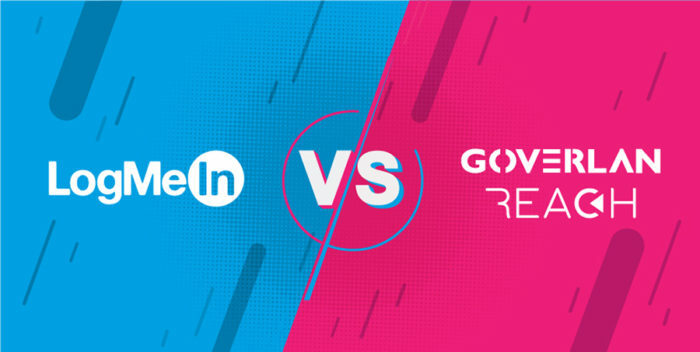 Goverlan Remote Support Blog > Competitor Product Studies > Goverlan Reach VS LogMeIn Central – how does the new pricing really stack up? Ever since LogMeIn acquired the Citrix Goto Business division, the company has been consolidating its different remote support solutions. This process has also seen it roll out several price hikes that have made LogMeIn Central more expensive every year since. Up until last December, LogMeIn Central pricing structure was based around feature sets. It offered three different editions: LogMeIn Basic, Plus, and Premier. LogMeIn Basic offered elementary remote control features, Plus had more advanced remote control features and background access, while Premier featured remote control, background access, task automation, and reporting. Each edition offered a tiered pricing structure that varied depending on the number of technicians and endpoints (or computers) a technician managed. Goverlan is a great LogMeIn Central alternative. Much like the previous LogMeIn Central offering, Goverlan offers three feature sets: Standard, Professional, and Enterprise. However, Goverlan’s editions include unlimited endpoints as well as more features for the money. For example, Goverlan Reach Standard includes advanced remote control features such as collaborative tools for IT teams, Multi-Machine Screen Monitor, and RDS Session shadowing that were either not offered as part of LogMeIn Basic or available in any LogMeIn Central edition. Goverlan Reach Standard starts at $29 per month per concurrent technician for unlimited endpoints – a considerable saving against the $50 per technician for 25 machines charged for LogMeIn Central Basic. 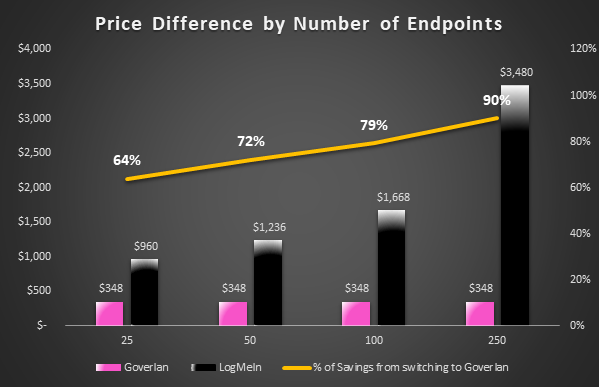 And the price differentials became even greater as you compared other editions: a LogMeIn Central Premium user with 250 endpoints would have been paying $5,951/per year more than a Goverlan Reach Enterprise user, while a LogMeIn Central Plus user would have been paying $3,171 more than the equivalent Goverlan Reach Professional user with 250 endpoints. At the end of last year, and without any prior notice, LogMeIn shifted from a plan-based to menu-based pricing structure. At the same time, it set about aggressively moving its customers from monthly to annual payments, changing business terms and conditions in the process. As part of this change, the company got rid of its Basic entry-level edition, replacing it with the new Base Plan. Although this offers a little more in terms of functionality than the old Basic edition, it also costs more, which leaves users who were just looking for remote control facing a considerable jump in both costs and commitment. Customers that were previously on LogMeIn Central Basic and paying $50 per month, are now faced with paying $80 per month for 25 computers on the new Base plan. On top of this, the features found in the former LogMeIn Central Premier package have been divided into three separate add-ons that customers need to purchase separately. The full package – which replaces the Central Premier plan and covers patch management, process automation and IT reporting – has gone from $133/month to $219 per month for 25 computers. Although on the surface this may not seem a huge price hike, once you start to look at that from an endpoint perspective things start to get much more expensive. If we assume that most IT service desk technicians support more than 25 computers on average, these price hikes are extremely uncomfortable for users with a large number of endpoints under management. 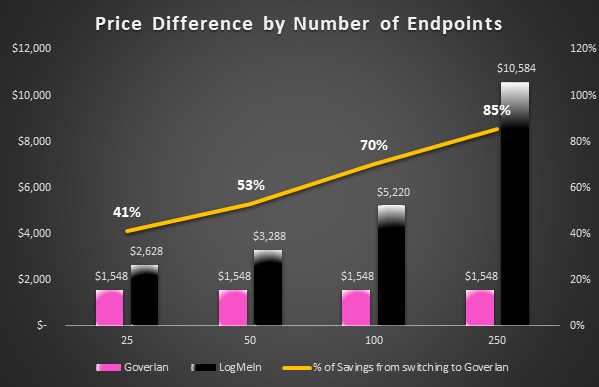 Using the same example we used above – a company with 250 endpoints under management – any one on the full LogMeIn package would be paying over $9,000 per year more than on the equivalent Goverlan Reach Enterprise edition. This means that with new price change Goverlan Reach has become a staggering 90% cheaper than LogMeIn Central in certain instances. Even against the old pricing model Goverlan Reach users benefited from a considerable cost savings advantage on LogMeIn Central users. Today, that price differential has almost tripled at the top end. This starts to raise serious questions around affordability for many users who have long questioned the LogMeIn’s business practices and customer friendliness.